You can see both successful and unsuccessful persons in any area.Whether you are businessman or teacher, there is no matter. You may be success or unsuccessful due to your own thoughts. 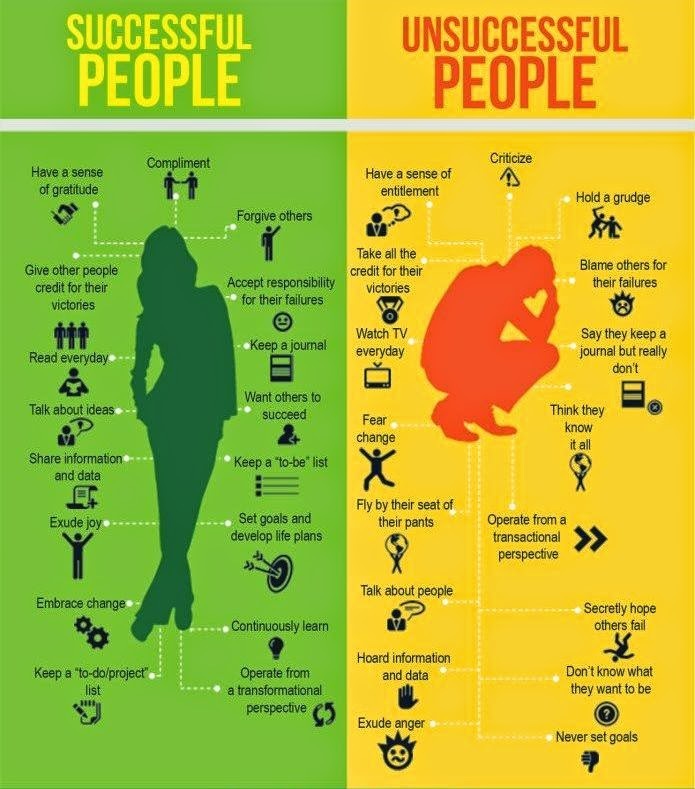 So, today, we compare their thoughts, if you want to be successful, you have to leave the thoughts of unsuccessful persons. Every person who gives the compliments to other person on their success, he will also become successful one day. When you will give greetings to other person, other person get happiness from this because it is the nature of human being. We all love true compliment. When any body praise of our any quality, we feel pride on this quality, for this, we are ready to give free help him. From today, change your thinking by using following words. 1. When a person says to you, he gets promotion, you should say, "Congratulations." Congratulations is not a simple word, it is so powerful. It is great word for your success, always remember this. 2. When you find any wonderful quality in anybody, always say, you are great. Like this, you can make your own dictionary of compliments and then see your way to success. This success, you can get in your student life, in your teaching life or in your business life. Nature's rule will apply everywhere. All unsuccessful persons use the weapon of criticizing other people. They have the habit of captiousness. They never see other person's success. They feel zealous when anybody grow. They start to criticize him by false allegations. They try to best to make him ignoble. When successful gets money and become rich. He will surely buy Car, big house and all other things. All his unsuccessful friend will say, his friend has become boastful. He does not talk with them. But, he does not know, his successful friend is so busy in his great projects for helping other helpless peoples. So, one day all unsuccessful people feel sad when they find that they were wrong. So, it is my suggestion, never criticize anybody if you want to become successful. It is the great quality in all successful people that they have the sense of gratitude. They will always be thankful of God. They will always be thankful to those who had helped him. They will always be indebtedness of their parents and their teachers. In my past life, I saw its great effect. Few days ago, I met my math teacher. I touched my old maths' teacher's feet. I say to him, "I am so thankful to him. Without, you, I can not grow and stand on my foot. I will be indebtedness to you in my whole life." When I told these words, my teacher gave me blessing. Few days after this, I saw, there is unbelievable increments in my income. So, you should trust in this. Always give thanks to other for other's small help for you. All unsuccessful persons have a sense of entitlement. They think, they are eligible for a specific position. Other have cheated him. He is best because he did all work himself. No one helps him. No God helps him. Now, you can think, how can he success in life. When he starts these type thinking, he falls down from top. No one will help him because he has become unsuccessful from his bad thoughts. He never think, when he was not money who gave him food. He never think, when he was no money who gave him clothes and shelter. If he has some money, it is because there is his some master. If he does not give thanks to him, his master never gives him curse but nature is seeing everything, he will get curse from nature. He will still be unsuccessful. Money will go from him like a bird who gets freedom from cage. When we share our knowledge with other, other knowledge will increase because we have practiced by teaching others. So, all successful people share information. If you are a student, share what you know to other. If any student is weak, start to teach him, you will become a successful student doing this. If you have grow your wealth, teach others, how did you grow your wealth by sharing your information. But all those who collects information and knowledge and try to best to hoard this, will never progress in their life because, it is rule of nature, if you will not share, your knowledge, you will forget all your knowledge. When you will forget, how can you be eligible for great success of life? So, think this and start to share something everyday with other. Today, I reading the book Secret of Rhonda Byrne. In this book, she has written the great rule of nature and its name is the rule of attraction. If you want to attract the great success of your life, you have to follow this rule. As per this rule, there is first condition, set a goal. Set a goal means, you will demand from nature, what you need. For example, you are earning Rs. 50,000 per month. You can set a goal of Rs. 5,00,000 per month. This is your demand from nature. All persons who want to set a goal, they surely get it because they demand from nature and nature will manage to give him. You are demanding Rs. 5,00,000 per month by setting a goal. Nature will collect Rs. 5,00,000 per month and give to you. It is not your duty, how will Rs. 5,00,000 per month be collected by nature because you have the trust in your demand and goal. Never leave this trust. There is great power in trust. Travel whole world and meet all the successful people whose name in Guinness World Records. All will say same words which I am saying to you. All have set a goal. They demand from nature. They trust on their demand because it was pure. So, they get. All those who never set a goal, never get success in the life. They will be always unsuccessful. Ok.
We all are human being and we are so dependent on each other. When you want others to success, it means, it is your way to success because when others will get success, they will surely make your way of success. If you start demands secretly others fail, your failure is sure because all those who dig for others will fall down first. So, from today, pray to God for the success of whole humanity by forgetting who is your enemy or who is your friend.